The expression “letting the fox guard the henhouse” refers to allowing a vested interest to control the object of its exploitation, but in an unfortunate real-life wildlife policy twist, it’s wolves, not foxes, in question and it’s they who need guarding. In a move that threatens the lives of hundreds of gray wolves in Idaho and Montana, Secretary of the Interior Ken Salazar announced March 6 that the government will uphold a decision made in the last days of the Bush administration to remove gray wolves living in the Northern Rockies from the Endangered Species List and the protection that it affords. The result will be that wolves will become targets for hunters and trappers via state “management” programs that give the most power over the wolves to the people who like them the least. State-sponsored wolf kills are strongly supported by ranchers who see wolves as a threat to livestock production and by hunters who consider them competition for trophy elk. Despite being a vital part of the Western ecosystem, gray wolves in the lower 48 states were wiped out by ruthless hunting, trapping and poisoning programs that began in the 1880s. Only in the last thirty years have wolves migrated from Canada or been reintroduced into wilderness areas to help restore the predator-prey balance and provide other habitat benefits long missing in the West. Legal battles have been waged in court for years regarding policies affecting gray wolves in both the Northern Rockies and the Great Lakes regions. 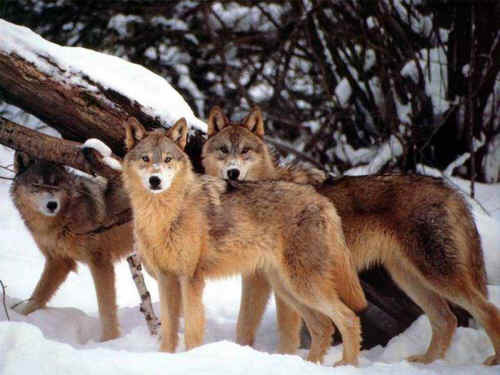 A U.S. District Court judge gave the wolves temporary federal protection in 2008 after environmental groups sued to maintain the animals’ Endangered Species status. On March 5, the U.S. Senate voted to keep language in the Omnibus Appropriations bill (HR 1105) that allows the Interior and Commerce departments to undo some of the anti-environment measures enacted by the Bush administration at the end of its term in January. However, Western lawmakers seem to be pulling the lucrative wool over the Obama administration’s eyes by convincing Salazar that their plans for wolf “management” have wildlife’s best interests at heart. In February, Idaho’s entire U.S. congressional delegation sent a letter to President Obama asking that control of that state’s wolves be left to state wildlife officials. Montana has set an arbitrary “management goal” of approximately 400 wolves in the entire state, which again means that any “surplus” would be subject to lethal “control.” The federal government wouldn’t intervene until or unless the wolf population dropped to only 100 individuals or 10 breeding pairs, a tiny fraction in the nation’s fourth-largest state. It's maddeningly ironic that as soon as a threatened or endangered animal like the wolf barely begins to recover from decades of slaughter, the first thought the state goverments have is to start killing them again. As in Idaho, hunters consider wolves to be competitors for elk, even though wolves are natural predators who kill only to survive, whereas human hunters with high-powered weapons are not. Hunting concerns greatly influence wolf “management” decisions, regardless of the impact that has on the wide variety of plants and other animals within the same ecosystem. Wolf policy is being set by a Wolf Advisory Council whose chair, Chase Hibbard, is (surprise!) a sheep and cattle rancher. Idaho and Montana will assume control of their state’s wolf populations 30 days after the new delisting decision is published in the Federal Register. Legal challenges have already begun, but in the meantime citizens can voice their opinions about the delisting by calling the U.S. Fish and Wildlife Service at (800) 344-9453 (select option “3” for endangered species and then “0” to speak with an operator). If the new administration is sincere about wanting science, not special interests, to guide environmental policy, then it will reverse this delisting decision and not allow the ranchers and hunters to "guard" the wolf den.